This week I once again found myself with that restless urge to cook up something new. 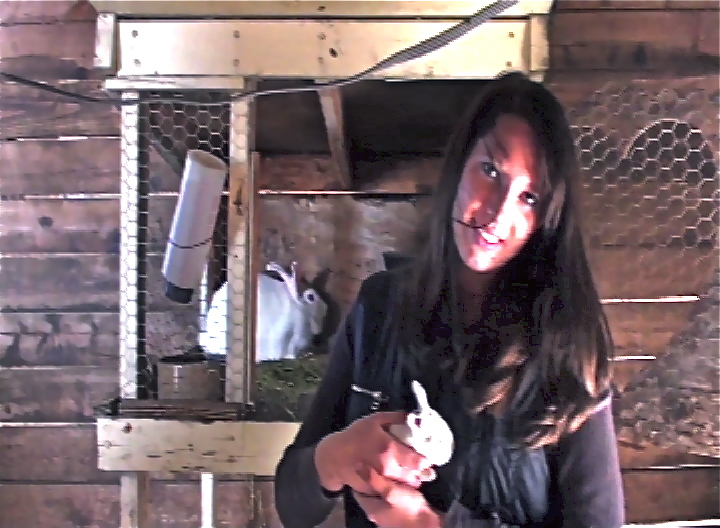 Rummaging around in my freezer, I pulled out a package from my Lefever Holbrook Ranch meat delivery: “rabbit ‘Rex’ 2.5 lbs.” Poor old Rex!–I may have scratched his ears back in September when I visited Paulette and her kids on the ranch. Rex wasn’t his name, of course–it was his breed, developed in France in the early 20th century. And now that I think about it, the rabbit I met in Goldendale did have a Gallic air about him, holding me with his dark gaze as I stroked his plush velvet coat. 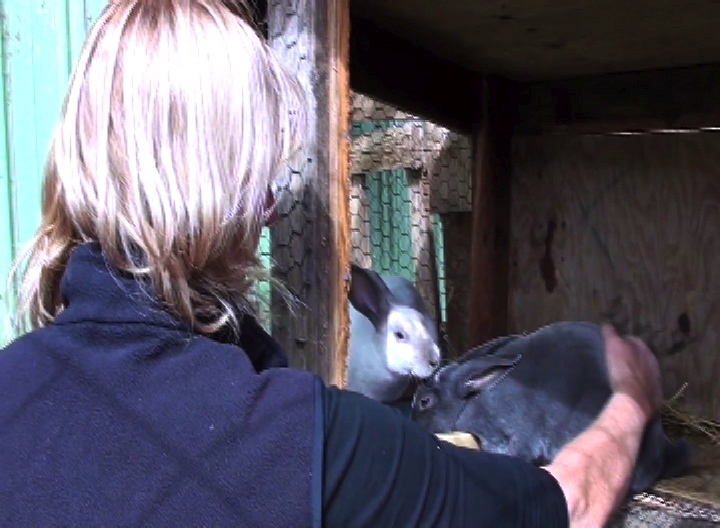 The whole rabbit family on Paulette’s ranch is pretty cosmopolitan; here’s Madison with one of the babies (“kits”), whose mother was a New Zealand (in spite of its name, first bred in Mexico, also around the early 20th century) and whose father was our friend Rex. (You’d recognize a New Zealand–a big fluffy albino white rabbit with ears that blush pink.) Since rabbits raised for meat are often harvested at two months old, and I got my order from the ranch at the end of November, I’m now thinking that my Rex was actually Rex fils, one of these September kits. With Rex now defrosting on my kitchen counter, I feel an unexpected pang. I know the usual things about him that I want to know about the food that I eat: where he came from, who raised him, how he was raised. But this time I know him. Why am I a carnivore? Like you, I’ve read any number of articles about the need to eat lower on the food chain–much less meat and more fruits, grains, and vegetables. For one thing, it’s easier on the environment; it takes 16 pounds of grain to produce one pound of meat, and methane gas from farm animals accounts for around 15% of the world’s greenhouse gases. Also, we’d show some shred of solidarity with the other seven billion of us on the planet–we can’t all eat this way, so maybe none of us should. And then of course it’s easier on the animals! But eating meat runs deep. When I was growing up in South Texas, we had meat at almost every meal. Ham and bacon. Plenty of beef–pot roast, steaks, hamburger in all of its chameleon forms. Chicken, the noble yard bird!–I remember helping my grandmother slaughter and clean them for Sunday supper. We got some of this meat by hunting. I went a few times, but my father and brothers went every year. My dad had an old Scout (precursor to the now ubiquitous SUV!) welded and bolted into a hunting machine–braces for standing up to scan across the mesquite brush for quarry, gun racks, a ball-mount tow-hitch to pull his beat-up old jeep behind them. In early fall, before the break of day, they would load up the bird dogs and head out to their lease to hunt quail and white-wing dove. In November, they went off for long weekends to the hunting camp, getting up early every day to hike out to their stand and sit silently for hours watching for a deer to emerge from the dawn shadows and mist. If they got their shot, on the way back home they would stop at Gafford’s grocery store to leave the dressed animal in a rented freezer locker. It was a tradition in our family that my dad would share his deer with a Mexican woman who worked with him, and then a few days before Christmas, she and her family would bring us venison tamales!–Dozens and dozens of them. To this day, when I am home for the holidays we have chili and tamales for our Christmas Eve meal. So eating meat, for many of us, is part of who we are, where we came from, how we savor the earth’s bounty together. Do we need to become vegetarians or even vegans? I can imagine getting there (or at least getting close) some day, but for now I just try to choose and prepare my food as thoughtfully as I can. So, I’m still a carnivore, though I hope a more minimal and mindful one. 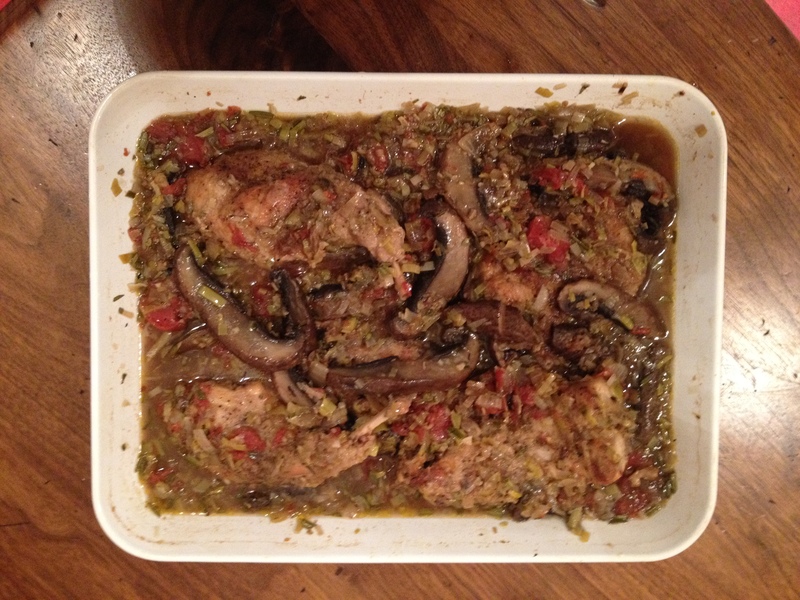 And today I braised poor Rex alla Cacciatora (hunter style). He was delicious! 1. Cut up the rabbit; the directions were complicated, but basically you want more or less the same pieces you’d get with a chicken–a breast (you can split it into two pieces), two front legs, a back, and two back legs (possibly split into two pieces each–thigh and drumstick, more or less). Heat 1/4 inch olive oil in a Dutch oven or deep, wide heavy skillet over medium heat. Season the rabbit pieces with salt and pepper, then dust lightly with flour. Lightly brown the rabbit for about 3 minutes o both sides, working in batches. Drain on kitchen towels, then transfer to a baking dish in one layer. Heat over to 375 degrees. Pour off the used oil, wipe out the pan and add 2 tablespoons fresh oil. Heat to medium-high, add the onions and cook till soft, about 5 minutes. Add the leek, garlic, rosemary and mushrooms. Season generously with salt and pepper; add red pepper flakes to taste. Cook for 2 minutes more, stirring. Add the chopped tomatoes and wine, and let the mixture reduce for 1 minute. Add the broth and mushroom liquid, bring to a simmer, taste and adjust the seasoning (but remember that the red pepper flakes will get hotter). Ladle the mixture evenly over the rabbit. Cover the dish, and bake for 1 hour. Let it rest 10 minutes before serving. I ate my first serving on a bed of fettucini. Tomorrow I might serve it on rice. Or potatoes? Or just a big slice of beautiful rustic bread.